For disbelievers: really. Here it is. 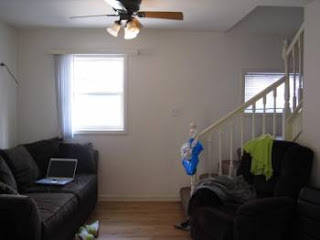 I've recently had a few people express disbelief that some of these photos are really from listings. But they are, they really truly are, and that's what makes the world such a wonderful place. 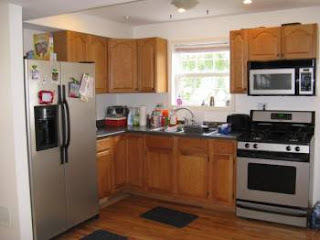 Sometimes the listing has been taken down or changed by the time I get it posted, but the photos I use are all snagged -- by me -- from actual real estate listings. Cross my heart. ... But then I read the ad myself. What?? I'd love to rent from this person. Especially if Alf comes with the place. But still... "Photo 1" two places? Not bogus! Never bogus! 100% guaranteed real or your time back (pending invention of time machine)! My theory is that Alf is the landlord and is trying to lure cat-owning tenants to the building. It just means that Gordon Shumway is the seller. That's the only reasonable explanation. Wow. That's crazy. But hilarious!! 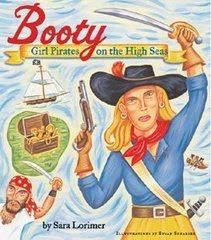 It was nice meeting you at Blogher! I can't wait to see more crazy listings, and I will totally be adding this to my husband's google reader, as he is obsessed with real estate. I've been lurking here for awhile and have noticed quite a few listings with, ah, photos of questionable relevance. How does this happen? 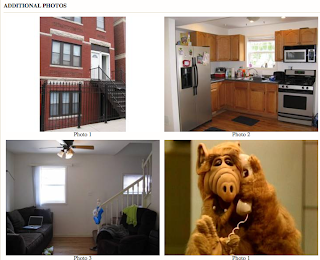 The listing agent just happened to have a photo of Alf on his/her desktop and accidently uploaded it? Maybe it's the agents secretary --who put up the listing -- getting him back for something, perhaps he looks like Alf! I would totally rent that place. 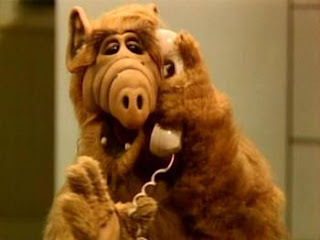 You don't get Alf everyday as an added bonus. I just got crappy neighbors and a leaking crawlspace when I bought my house. Are there still people who believe that anything that is mildly odd or humorous MUST be Photoshopped? Well, yes. Yes, there are. These are people who are blithely living a literal paradigm in which funny doesn't just happen, it must be created. I'm pretty sure they work for ABC. I live in the Chicago suburbs. I want to drive up to this place now and find Alf! ROFL I really needed that. My DH would be calling immediately. He loves Alf, and that is sad. "For those in the know, Pilsen is a historic Chicago neighborhood that offers a quick and easy commute to downtown, UIC, IIT and the University of Chicago via the el." Yeah, but what is it for those of us not in the know? Sorry to be a wet blanket, but this is sort of a marketing thing with a local rental agency, Raider Realty (see here for more links: http://chicago.craigslist.org/search/apa?query=raider&catAbbreviation=apa&minAsk=min&maxAsk=max&bedrooms=). You'll see pictures of Borat, Mini-Me, etc. in their listings. Usually, though, they have some sort of headline that refers to the picture--maybe this one didn't make it through the copywriter (who was supposed to add the Alf reference) before it was posted to CL. Anonymous is absolutely right. This agency does this with every single listing. I believe they were the ones who had the infamous "dude in beer tub" photo? So yeah, it's on purpose.